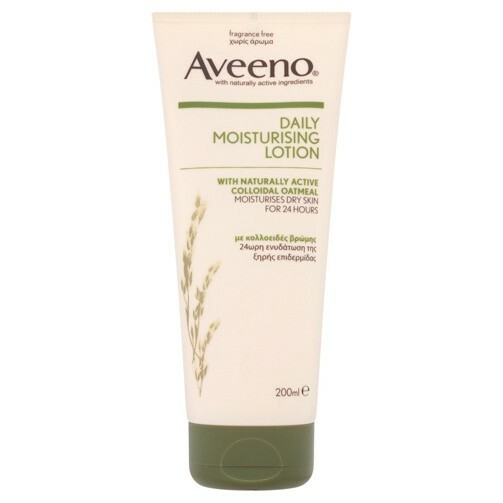 A skin lotion formulated with a naturally active combination of rich emollients and Colloidal Oatmeal Aveeno Daily Moisturising Lotion will revitalise and nourish dry skin. The fast rate of absorption allows the product to take effect almost immediately. Aveeno Daily Moisturising Lotion is clinically proven to go far beyond the standard 24 hour moisturisation process - instead significantly rebuilding your skin's natural barrier as well as protecting against dryness and irritation. With regular use over a period of two weeks Aveeno Daily Moisturising Lotion can visibly improve the appearance of your dry skin - leaving it feeling much softer and in a significantly healthier condition. Without the presence of added fragrance this skin lotion eradicates the strong smell of many skin lotions whilst being kind and gentle to skin.